A ‘disruptive technology’, that is what Elevance Renewable Sciences calls the metathesis reaction on which the company is built; never omitting the proud words ‘Nobel Prize winning’ (Chemistry, 2005). They use it to turn their feedstock, mainly palm oil (but potentially also soy, canola or rapeseed, jatropha etc. oils), into a wide variety of lubricants, personal care products, waxes, solvents, polymers and renewable chemical building blocks. 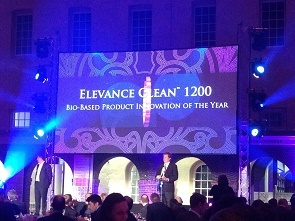 Their present star product, Elevance Clean™ 1200, took the award for the biobased product innovation of the year at the World Bio Markets conference in Amsterdam, earlier this month. ‘Were you surprised to be honoured the award?’ I asked Andy Shafer, the company’s Executive Vice President the next day. ‘Well, I know that our product has an outstanding performance, so I was quite confident,’ he told me. Elevance Clean™ 1200 ‘outperforms traditional and bio-based solvents for industrial degreasing applications targeted toward heavy manufacturing, transportation maintenance and repair operations (MRO), and industrial food processing,’ the Elevance website tells us. In addition to its very good performance, it meets even the strictest standards in VOC emissions. VOCs (Volatile Organic Compounds, like the toluene in your paint or the gasoline in your tank) are held responsible for a critical role in the pathway to ozone production at ground level – ozone that is definitively bad for your lungs. VOC regulation differs among countries and states, but standards have become much stricter over the years and many companies now prefer to be on the safe side of standards. Like with Elevance Clean™ 1200. And as a final advantage, Elevance’s star product is biobased as well. Elevance, a spin-off of Cargill down in 2007, is a remarkable company as it produces a vast array of industrial products with just 150 staff, located as far apart as Chicago and Surabaya (Indonesia). How can they manage this? ‘Have you got a strong corporate culture?’ I asked Andy Shafer. ‘Yes, very much so,’ he answered. ‘We have six core values’ (and he went on to enumerate them, but got stuck at five, ‘I always forget one, always another’, and indeed, six is an awkward number). These core values are: collaboration, innovation, passion; and progressiveness, pragmatism and trust. The word trust caught my mind, for we live in a world in which distrust is in the fabric of society and almost being institutionalised; it was nice to hear that companies like Elevance do not only develop clean technologies but also consciously try to improve human relations. And I recalled the famous book ‘Trust’ by Francis Fukuyama, one of America’s leading philosophers, in which he holds that trust is essential for economic growth. One of the reasons that Elevance can be active in quite a number of markets (and have a 180 kt production facility) with such a small number of staff, is due to its philosophy of collaboration. It shares as much as possible with other companies, both large and small, in order to make use of ‘complementary assets and capabilities’, and ‘reduce development investment and risk’, according to Andy Shafer in his speech. This ‘creates differentiation and business growth’ whereas ‘progressing towards sustainability goals’ at the same time.